Tesla CEO Elon Musk has long used Twitter to criticize short-sellers. The prominent short-seller Andrew Left has sued Tesla and CEO Elon Musk, saying Musk fraudulently engineered his since-abandoned plan to take Tesla private to "burn" investors hoping the electric car company's stock price would fall. Left, who runs Citron Research, said in his proposed class-action complaint on Thursday that Musk's issuance of materially false and misleading information harmed short-sellers as well as those hoping Tesla's stock price would rise. 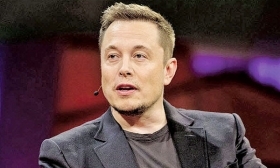 The shareholder lawsuit is one of at least seven targeting Musk since he stunned investors on Twitter on Aug. 7, saying he might take Tesla private in a $72 billion transaction valuing the company at $420 per share, and that "funding" had been "secured." Musk announced on Aug. 24 that Tesla would stay public. Tesla did not immediately respond to requests for comment on Left's lawsuit, which was filed in San Francisco federal court. Short-sellers borrow shares they believe are overpriced, sell them, and then repurchase shares later at what they hope will be lower prices to make a profit. "Defendant Musk artificially manipulated the price of Tesla securities with objectively false tweets in order to 'burn' the company's short-sellers," Left said. "In the succeeding days, the truth regarding the supposedly 'secure' financing needed to effectuate the going-private transaction began to emerge, exposing the fraudulent scheme," he added. The proposed class period runs from Aug. 7 to Aug. 17, over which time Left said he bought and sold millions of dollars of Tesla shares. That period ended after the New York Times published an interview in which Musk, who owns about one-fifth of Tesla, described severe stress he faced running the Palo Alto, Calif.-based company. Finally, on the evening of Aug. 24, a Friday, Musk, by then facing U.S. Securities and Exchange Commission scrutiny into the factual accuracy of the "secured" tweet, Musk blogged that Tesla would remain public, citing investor resistance. "The sentiment, in a nutshell, was 'please don't do this,'" he wrote. Tesla shares were essentially unchanged, closing at $280.95 on Thursday. They have lost more than one-quarter of their value since reaching an intraday high of $387.46 on Aug. 7.